Home Science for Kids 5 Ws & H Why do Locusts Swarm? Have you ever tried chasing a frisky grasshopper? If you have, you will definitely know that scampering after a jumpy bug is not an easy task. Most species of grasshoppers have a keen sense of hearing and the moment they sense trouble, they can hop fast and furious! 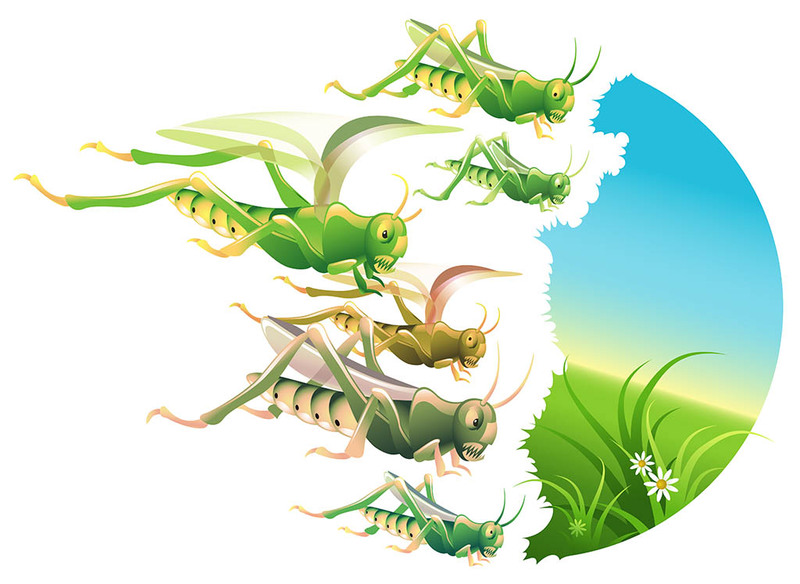 Sometimes, shortage of food turns grasshoppers into migratory insects as they venture out in search of newer pastures. This situation happens when the species begins reproducing rapidly and does not have enough food for all the members of its community. When a normally non-migratory grasshopper becomes migratory, it changes its external form and becomes what is known as a locust. For instance, a locust’s leg muscles are more powerful than our muscles and can propel the insect higher than ten times its own length. At the highest point of the jump, the insect begins to use its wings to move through air. In fact, true locusts are migratory short horned grasshoppers. Normally, they are shy and prefer to be alone. But in a huge swarm, they become a menace and are capable of stripping a field in a matter of hours. Until recently, little was known about why solitary grasshoppers change their behaviour when in company – grouping together to indulge in widespread mayhem. Now, zoologists at the University of Oxford, UK, say they have identified the biological mechanism that causes locusts to swarm. Headed by Stephen Simpson, the team has pointed out the sensitive hairs on the insects’ legs, which activate swarming. Incredible as it may sound, this discovery was made by tickling locusts under study, with a paintbrush! Tickling other parts of the locust, such as its antennae or back had no effect on behaviour. It is the tiny hair on the hind legs that get stimulated when the insects group together – turning the harmless insects into destructive pests. The scientists point out that the nervous system sends a message to the insects’ brain, which in turn triggers off a chemical reaction that results in swarming! The research team says that this discovery has great importance for it could finally lead to the production of insecticides capable of stopping vast swarms of locusts from wreaking havoc on crops. Why do Onions Make us Cry? Where does the Pigeon Post Operate? How does a Submarine Work? Pitara literally means ‘a chest full of surprises’. For the last 18 years kids have been coming here to explore, discover, learn, play & enjoy. We continue to surprise and delight children with our unending range of multi-cultural, multi-lingual and inclusive content.The content on this site is copyright protected. Over the years some of the worlds leading publishers have licensed our content, please get in touch with us if you wish to use our content.